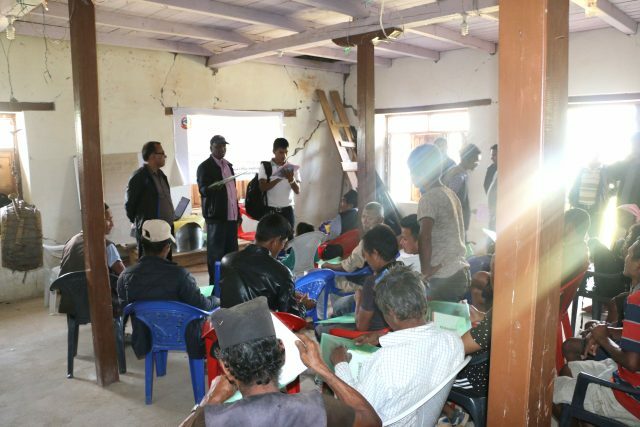 As part of the shelter intervention, NJSI has begun the Mason training on 23rd October 2016, for 20 people who will lead the shelter construction in Gyalthum Mankal-1, Sindhupalchowk district. The training, as per the requirement by the Government regulations, will teach the participants how to build the earthquake resilient houses in the village. The training is given by engineer Ram Prasad Bhattarai along with two supporting engineers from Department of Urban Development & Building Construction. Fr. Roy Sebastian, SJ, Director of NJSI, has inaugurated the training course. The main objective of the training includes giving knowledge and awareness about the need to have earthquake resistant building, give practical experience in developing construction skills and organize group support and team work in the process of building individual homes. 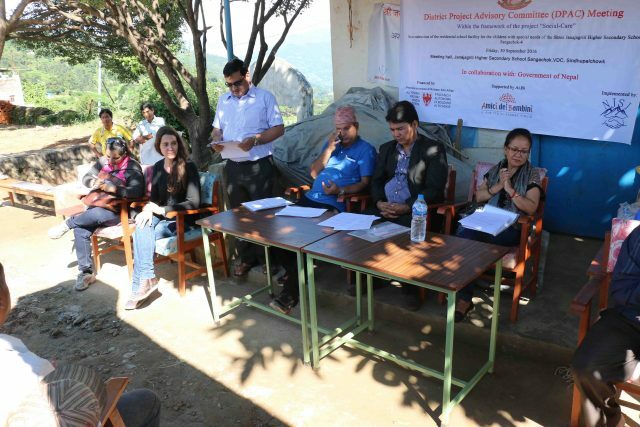 The meeting with District Project Advisory Committee (DPAC) was organized by Amici De Bambini and NJSI to observe and evaluate the progress of construction work of the hostel for special children in Sangachowk. As the meeting began MR. Dhurba Raj Giri a teacher of the Higher Secondary school addressed the gatherings and invited Fr. Arul SJ to welcome all the dignitaries present there. Fr. Arul SJ, the project coordinator of NJSI, welcomed all. He highlighted that the objective of he project is to provide safe and better environment for special children who are neglected. The construction of the hostel will also help the children to come back to school as they have not return due to lack of infrastructure. Fr. Arul SJ also explained about the challenges that was faced by NJSI. Due to long procedure, NJSI and the Amici De Bambini had to wait for almost one year to begin the construction work though the land and the design of the hostel was finalized. He also expressed his joy for the construction work that began in the month of July 2016 and will soon be completed. He thanked all the members of project advisory committee for their support. Miss. Francesca Giovannini the country coordinator of Amici De Bamini explained that the objective of the DPAC meeting were to review, analyze and discuss the achievement of the project. And also get the feedback and suggestions from the District Project advisory Committee. She expressed her gratitude to the sponsor agency of Bolzano in Italy, government of Nepal and NJSI as well for their support. Fr. Roy Sebastian SJ, the director of the NJSI spoke about many activities of NJSI in various districts that are being carried out and thanked all the dignitaries for the support. As the presentation of the project was over there was an open discussion by the all the participants present there. The teacher and care taker of the special children expressed their difficulties of being with the special children due to the lack the adequate training and being alone as a caretaker. The Local development officer assured that the steps will take to improve the situation of the staff and they will plan out to solve the problem of the children. Together with this he thanked the Amici De Bambini and NJSI for their collaboration in building the Nepal and appreciated the strategies of working in the VDCs. As the meeting was over the officers along with the Amici de Babini went around to see to examine building that was almost completed.